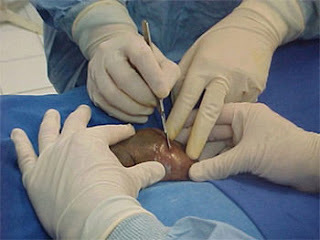 A common fashion these days in some IVF clinics is to do TESE-ICSI for men with severe oligoasthenospermia ( low sperm count). This is justified by saying that these men with " abnormal sperm" have high sperm DNA fragmentation, and this will result in poor fertilisation and poor quality embryos. The solution they propose is extracting sperm directly from the testes, by doing a TESE, the theory presumably being that testicular sperm will not have as much DNA fragmentation because they are "fresh". Of course, it also goes without saying that doing an additional procedure allows the IVF clinic to charge more ! This is complete rubbish, and TESE should only be done for men with azoospermia ( zero sperm count). Please don't let the doctor assault your testes for no rhyme or reason !